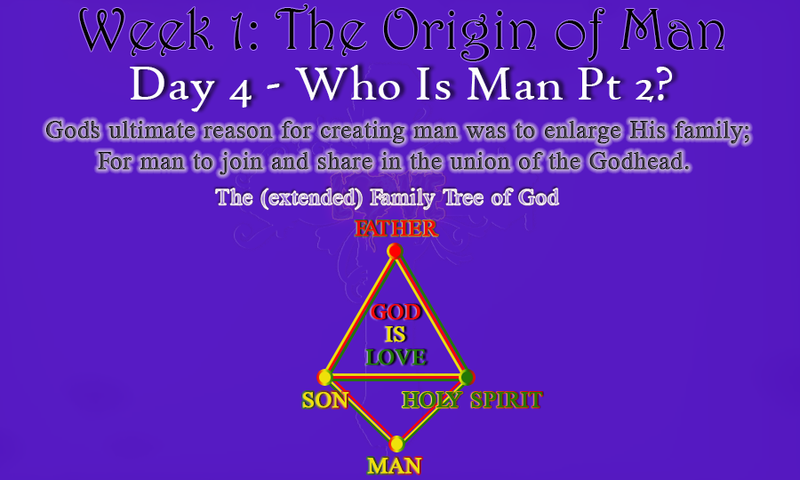 Week 1, Day 4 – Who Is Man Pt2? God had placed his nature into another being outside of Himself. Man (i.e. humanity) was made to be like God in nature but not to be God in glory or stature. It’s why Man is of matter. Man was not made to be complete within himself in the sense that, he does not have life within himself. He was made to be completely dependent on God who is the source of all life. Man (Adam) knew this and was contend for the purpose for which He was created. As time passed God (Father, Son & Holy Spirit) would continuously come and commune with Adam sharing His heart desire, His plans for the earth and the universe. Adam is wowed by the intimate moments he gets with God realizing not every creature gets this time with the Creator; not even the mighty angels. He’s starting to see that He’s truly a unique being even though in stature he does not even come close to the angels let alone God himself. Then one time while Adam was having his normal intimate time with God; he ask God “what is it about me that makes you so mindful and interested in me; that you would leave your throne and all of heaven to come down in this garden just for me? God had been waiting for Adam to ask Him this question. His relationship with Adam is truly like that of a friend. He would communicate with Adam to his level, revealing and explaining things and even who He is to Adam as he becomes aware of it in time. God created man out of Himself to share the relationship He has with Himself. Just as God is a family because of Love, so was man created cos of Love. God’s ultimate reason for creating man was to enlarge His immediate family to include man within the Godhead. This is why God made man with His nature (His image and likeness). God decided to enlarge His family by creating a new being out of Himself; not to be independent of itself but rather sourcing life from Him. 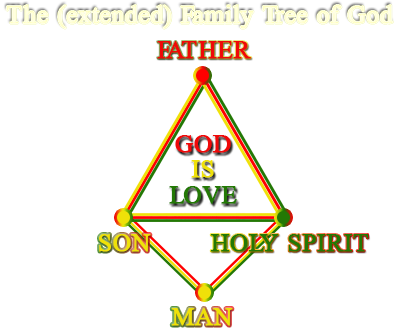 In this way; the family tree of God was modified or extended to include Man. I could imagine Adam jaws dropping as he listens to God telling him about this. He has stood in the very presence God in all of His majesty and glory and one thing he knew for sure; there’s nothing like God. He’s set apart from anything & everything and he Adam was made to be joined to that. Does this mean he’s going to become like God, he wondered? Only if Adam knew that he’s already like God; that no matter what, he could NEVER be as God in stature simply because he Adam, came into existence through the conscious decision and plan of another being (i.e. God) but God wasn’t; Adam was created and therefore, he had a beginning but God doesn’t. Today, as you think about this; ask God to make this real to you. Ask him to reveal the truth of this to you personally in a way that’ll be comprehensible to you. Let this lead to a conversation between you and God. Father thank you for your overwhelming love for me. Holy Spirit I pray that you take these truths and make it known to me. Take me and sit me on the Father’s lab that I may catch a glimpse of His heart towards me. I want to know what He thinks about me and his intentions towards me. I pray that you’ll give me the desire and the heart to respond rightly to you as you draw me close. In your beloved Jesus Christ’s name I pray. Amen. Tags: DNA of God, Union with God, Uniqueness of Man, What is man?